The mysterious tracks found in central Turkey. Turkey seems to be a hot spot for possible proof of ancient aliens, or ancient civilizations. 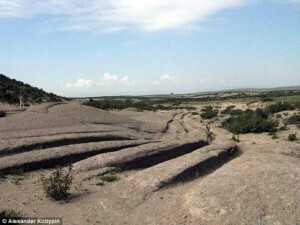 According to a very well liked and respected Russian geologist these ancient tracks were left by vehicles that belonged to some sort of advanced ancient civilization that inhabited our planet 14 million years ago, or possibly whoever they were, were just visiting. These tracks were found in central Turkey and many geologists as well as many other experts belive these mysterious tracks were made by intelligent beings. Dr. Alexander stated that these ancient vehicles were driven at a time when the ground was soft due to volcanic activity. Because of the great weight of these vehicles they left behind very deep grooves, which eventually petrified and turned into evidence. Petrified footprints of dinosaurs are preserved and dated in the exact same way. The methodology of knowing the exact age of volcanic rocks is said to be very precise. Every since this discovery tons of experts have flocked to central Turkey to examine these ancient tracks for themselves. And they all agree that these tracks had to have been made by ancient vehicles roughly 14 million years ago. According to these archaeologists as well as many other experts they all believe without a shadow of a doubt that these ancient tracks are the best preserved pieces of evidence that proves the existence that a highly advanced ancient civilization inhabited our planet millions of years ago. Now, why are these tracks so special, why do these tracks make all these scientist belive so strongly that intelligent beings were joy riding in central turkey 14 million years ago. Firstly volcanic rock dating is extremely precise and what ever made these tracks had to do it at a time when the volcanic rock was soft, which was roughly 14 million years ago. Secondly the distance between each pair of tracks is always the same, it never changes, and there is just no way nature can do that. So in short the mysterious 14 million year old Turkey Phrygia Valley tracks is another victory for ancient aliens or ancient advanced civilization believers. « Paranormal Junkies Favorite Top 10 Creatures Caught On Tape That Might Just Be Real!